The AVP iPhone App is now available for free download! The Official AVP iPhone App is now available for download in the App Store. The much anticipated AVP iPhone App is now available for free download in the Apple App Store. 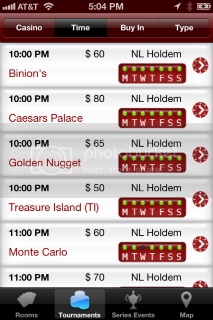 This all new App includes all the great info you get from the AllVegasPoker.com website in a convenient touch screen mobile App friendly version on your iPhone. Every single tournament, special event, cash game, and room is included on the App as well as a host of additional content and one click links. 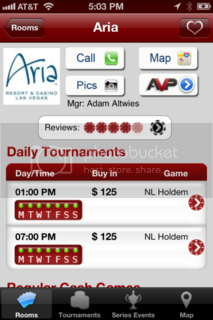 Every single Las Vegas Poker Room is now at your fingertips, with instant call buttons, photos, and even GPS maps and directions, optimized for your iPhone. Information includes all of the following and much more! Poker Tournaments – Days, Times, Buy-ins, Structures, etc. Cash Games – Games, Stakes, Blinds, Buy-ins, etc. Poker Rooms – Contact info, Reviews, Photos, Games, etc. Please consider rating the App and submitted a review through the App Store! We would sincerely appreciate it! Very sweet deal. Program looks nice and clean! Waiting on the Android app here as I don&apos;t have an Iphone. I love the app. Someone on Twitter said it best though, something like it sadly reminds me of how far I am from Vegas. I have a droid, too, but I downloaded it to my ipod touch. It doesn&apos;t seem to work. It loads, shows a logo screen for 7 or 8 seconds then closes. Anyone else having this problem on an ipod? Especially since when I first launch it shows me 7614.8M from the MGM poker room. I know I&apos;m far, I&apos;m not that far. This is probably due to connectivity problems. I recommend trying it a couple more times in better connection spots. If that doesn&apos;t work, let us know...but we haven&apos;t been hearing about this problem too much. I downloaded and tried it at my house, where the wifi is outstanding. I tried downloading directly to my ipod, and through itunes, and neither worked. Looks like a cool app. I hope you make an Android version though. This is currently in the works! Bump, so maybe Jon will see I&apos;m not the only one having problems. The previous poster has the same problem on his iPhone, so I don&apos;t think it&apos;s a connectivity problem. Thanks for pointing that out. We will have a look into that. Edit: Could you please tell us your iPhone model (3g, 3gs,..) and your iOS version? Thanks. Thanks for bringing this to my attention razor. Large is going to fix this for us! I don&apos;t have an iPhone. I have a 3rd generation iPod Touch running the latest software update. Rileyg is the user who posted previously that he had an iPhone that was doing the same thing. rileyg, would you mind telling us your device model and iOS version too? Thanks in advance. Any news on the Droid Version? I downloaded the iPhone version last night with no problems. It did tell me Wynn was 7,600+ miles away, but then it figured it out;) &apos;m in Kentucky.) I&apos;ll definitely be using it on my trip beginning Friday. It will be great for finding tournaments and other references. Thanks a lot. Getting ready for my annual snowbird trip. I have a Droid phone so will be waiting for that version. In the mean time, is there a web version of this info available. 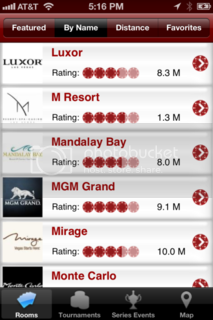 Are any of the MGM rooms included in your database. They seem to be avoiding Bravo Live - assume this is a corporate decision. DoubleB, all of the info on our app is also available here on our website! We have all of the MGM rooms, etc. Droid should be out within the next week or so. It&apos;s in testing now. Our Android App was already released. If you like it, please don&apos;t forget to rate it, it just takes a few seconds and helps us a lot . Is there any plans to do an update to either the iOS or Android, apps? The app looks decent enough on my iPhone 4 but it could use some better graphics and be designed to be universal (scalable) for both iPhone 4(s), iPhone 5, and iPad.